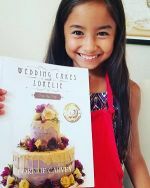 Best Wedding Cake Fillings For Fondant Cakes? 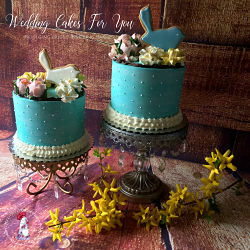 What are the best wedding cake fillings for fondant cakes? The bride wants a blueberry mousse filling for her wedding cake that will be covered with rolled fondant. I don't think it will hold up and the cake will be sitting out for a while for an outdoor (probably 75 degree) reception. What would be a better blueberry choice? 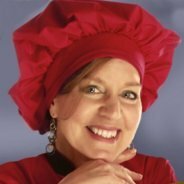 What kinds of fillings work best for fondant cakes so I can advise in the future? I have also wondered what kind of fillings are used in those pictures I see of fondant cakes with 1/2 inch of filling between the layers? I have made many beautiful cakes and my fillings never look like that. I am just an amateur and only do 9 or less cakes per year for mostly family and friends. I would not recommend a mouse for a fondant cake for a couple of reasons. One-it is too light, and two-it's not safe-if your mousse has eggs or cream in it. (I don't refrigerate my fondant cakes once covered with the fondant because it gets wet and shiny. )You could offer a ganache' or a butter cream filling and add fresh blueberries to either one of those. With buttercream and chocolate ganache' fillings you can make a dam of icing first and fill each layer pretty well., refrigerate and get the cakes firmed up before crumb coating and putting the fondant on. 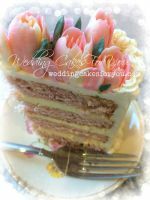 You may want to take a look at some of the decorating a cake questions and answers on this website from other readers. Thank you for writing back so soon. I appreciate your advice and will probably try to come up with a white chocolate blueberry ganache' for the filling and refrigerate it before stacking and crumb coating. Thank you for your site. It has many helpful tips. Hello. I'm back again...I've been gathering my ideas for my sister's wedding cake and I saw this brand on your website, Satin Ice Fondant. I've never played with fondant before, do you have a video or step by step process on how to cover cakes with fondant or with this product? I'm doing a 4 tier heart shaped wedding cake. I'm just really confused on what I should do as covering the cakes. I just want to do something simple and elegant. If you have any advice, please let me know. Thanks! I would suggest buying some fondant and playing around with it before making the wedding cake. It does take some practice. The Satin Ice is nice to work with and comes in a variety of colors. 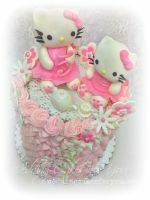 The link above will take you to Candyland Crafts which is based in New Jersey, and ships worldwide. 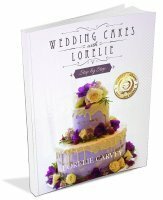 I can suggest that you get the Wilton Wedding Cakes A Romantic Portfolio.There are clear instructions in this book for you to follow. They do have this book at Candyland Crafts as well. Here is a demo video on covering a cake using Satin Ice fondant. He does a marbling and a textured design which is interesting. What is the best filling for fondant cakes? I heard that they shouldn't be refrigerated? Yes that is true. The fondant will get shiny and sticky in the refrigerator. The best filling for fondant cakes are any flavor buttercream or a ganache. Chocolate ganache hold up very well because it stays fairly solid and really holds the cakes together. Either way you will need to keep the cakes in a cool spot. 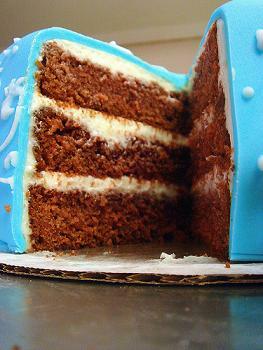 Here is a great post on the best moist cake recipe and filling for a fondant cake. 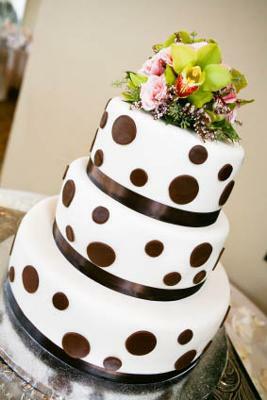 Do you have to use fondant on a wedding cake or for any cake of that matter? Hi Latacha, No you don't have to use fondant at all if you choose not to. There are many varieties of frosting's and icings that cake decorators use. Buttercream is typically used and there are different kinds of buttercream. Most are made with real butter others are made with a Crisco base. I have a few here on this site. An Italian Meringue Buttercream that I call Wedding Cake Frosting because I use it for my wedding cakes mostly. Cake Decorating Frosting, which is a royal icing. Royal icing is sometimes used over marzipan for a beautiful white and smooth finish as well. If you were to get a bride who wants a dark chocolate then you can use this chocolate ganache recipe. Hope that helps. Good luck with your home based cake decorating.